The on-going reform in the water policy of the Country will continue to enhance the provision of irrigation and portable water to Nigerians. This follows the Federal Government Construction of about thirty seven Dams across the Country to provide water for dry season farming. 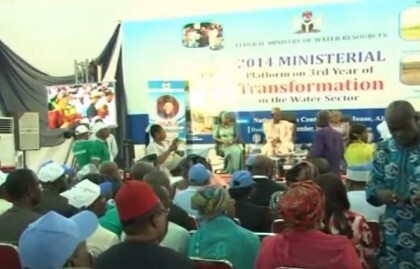 The Minister of Water Resources Mrs. Sara Ochekpe disclosed this at this year’s Ministerial Platform of the Ministry. The minister further stated that the National Water policy which is being reviewed with the support of development partners will continue to develop water management and sanitation in Nigeria. Mrs Serah Ochekpe said in addition to the construction of 37 dams, the ministry under the transformation agenda of the federal government has provided irrigable land for dry season cultivation, thereby improving food production. Minister of Information Mr Labaran Maku appealed to Nigerians to continue to safeguard government projects in their domain. He said the government will continue to provide security and social amenities to the people. The development partners such as the World Bank and EU have commended the federal government over the successes recorded in the development of water and sanitation and pledged their continues support.